The success of Healthy Michigan has extended beyond the ability of thousands of low-income working residents to get health insurance and medical treatment by helping improve the quality of life for those recipients, said speakers at a forum on the future of Medicaid and Healthy Michigan Wednesday. If the program ends as part of a congressional repeal of the federal health care law, thousands of Michigan residents will be confused and will turn to state lawmakers for answers, speakers said. The possibility of losing benefits that have already had a significant effect on recipients "breeds confusion and it breeds distrust of the whole system in general," said Amy Zaagman, executive director of the Michigan Council for Maternal Health and Child Health. The forum, sponsored by the Institute for Public Policy and Social Research at Michigan State University, was held some 48 hours before President-elect Donald Trump is sworn in as president and as efforts to repeal the controversial Patient Protection and Affordable Care Act are underway. Both houses in Congress passed resolutions last week calling for its repeal, and Mr. Trump has called for the act to be repealed and then replaced. What would replace the act is uncertain. Mr. Trump made some comments in a newspaper interview that the replacement plan would include insurance for all people, but his spokesperson walked those comments back, suggesting a replacement would not have a universal requirement. The attitude of the panelists toward what might replace the ACA, as well as what would happen to Medicaid and specifically to Healthy Michigan, appeared grim. Steve Fitton, the former head of the Medicaid program in Michigan and now with Health Management Associates, expressed probably the most optimistic tone, though he was cautious as well. Seema Verma of Indiana is Mr. Trump's nominee to head the federal Centers for Medicare and Medicaid Services, and Mr. Fitton said she helped design the Medicaid expansion program for Indiana and consulted with Michigan on the structure of Healthy Michigan. Her presence could indicate the new administration could be more sympathetic to the states with Medicaid expansion plans, Mr. Fitton said. Plus, U.S. House Speaker Paul Ryan (R-Wisconsin) has proposed an ACA replacement plan that "does embrace" the concept of universal access. "It's very important to note that," Mr. Fitton said. The debate underway, which mirrors in some cases the debate in 2009 and 2010 on creation of the health care plan as well as the debate in the 1990s over a health care proposal made by then-President Bill Clinton, reflects the internal debate Americans have had over the issue of health care, Mr. Fitton said. Americans think there is "an obligation to treat, but they don't think there is an obligation for health insurance," he said. There are both economic and psychological benefits to programs such as Healthy Michigan, speakers said. Larry Martin, an economist at MSU, said lower income individuals with health insurance tend to earn more than those persons without insurance. Also, state governments that spend on Medicaid programs see about a 7 percent return on their investment, Mr. Martin said. Timothy Michling with the Citizens Research Council of Michigan said persons with health insurance tend to miss less work as well as increase their financial stability. Healthy Michigan closed gaps in insurance overall, Mr. Michling said. And it helped stabilize the finances of rural hospitals, which tend to struggle more, Mr. Michling said. Just as people do not buy homeowners' insurance to prevent fires but to help them rebuild in a catastrophe, health insurance provides assurance to individuals they are less likely to face financial ruin in a health emergency, Mr. Michling said. 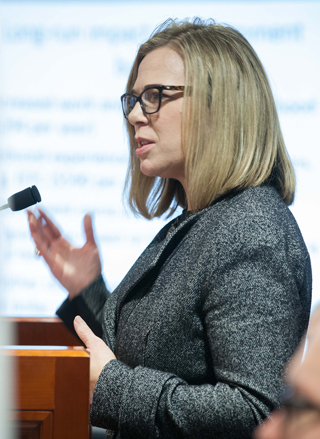 Ms. Zaagman said she had not anticipated much effect from Healthy Michigan on low-income pregnant women and children because that is a population eligible for Medicaid anyway. But pregnant women lose their eligibility 60 days after delivering, and Healthy Michigan provided them with coverage beyond that cutoff. The longer coverage allowed that population not only to get continuing treatment for medical issues such as hypertension, but it also allowed them to teach their children by example responsible attitudes of seeing a physician when needed, she said. It also helped women better plan their pregnancies, Ms. Zaagman said. Some 50 percent of pregnancies under Medicaid are unplanned now, she said. Should Healthy Michigan be ended, the state would face significant financial pressure to match the services and benefits the public received, the speakers said, unless it could find a source of revenue. Some officials have talked about making Medicaid overall a block grant program, but Mr. Michling said a block grant could be a big draw on the state's budget. Mr. Fitton said much of the push to repeal the ACA focuses on the taxes it raised, but many lawmakers still want to provide some subsidies to individuals. "The only conclusion I've come to is that Medicaid will be targeted," he said. Ms. Zaagman said it was critical to ensure that congressional members understood what Medicaid did and what it could mean. Otherwise, she said, "I don't see saving it without moving people off the program." Reprinted from Gongwer News Service Jan. 18, 2017 with written permission.